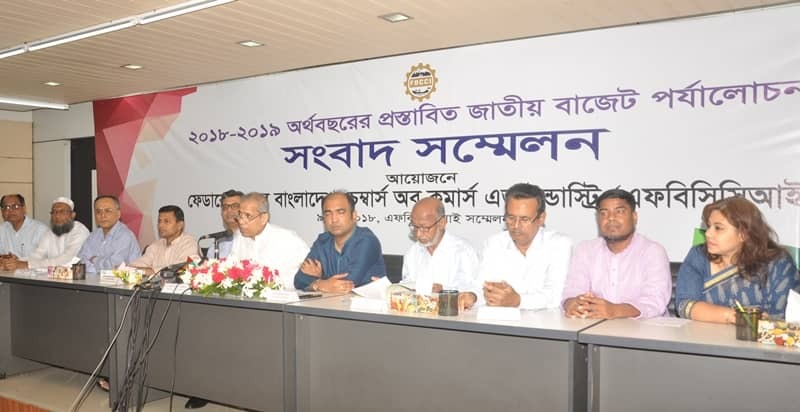 The Federation of Bangladesh Chambers of Commerce and Industry (FBCCI) on Saturday sought exemplary punishment for those who have misappropriated and plundered money from the country’s banks. President of the apex trade body M Shafiul Islam Mohiuddin came up with the demand at a post-budget press conference in its office. “No one from the FBCCI will be lobbying to save those involved in the robbing of money from banks,” he said. Mohiuddin said those involved in the Basic Bank and Farmers Bank scams are under trial but did not mention the name of any particular person. The FBCCI President called for lowering the corporate tax for the garment and re-imposing 0.70 percent source tax on exports. Mohiuddin also demanded that the tax-free income limit at individual level be raised to Tk 3 lakh. Finance Minister AMA Muhith on Thursday proposed a mega budget for the 2018-19 fiscal year. Mohiuddin said the proposed budget is investment-friendly one but it cannot be implemented smoothly for lack of managerial capacity. He urged the government to reduce the same amount of corporate taxes in other sectors. The FBCCI President said the government will have to face challenges in implementing the budget if there is a lack of transparency and accountability. He said the businessmen do not want any such political environment which might have negative impact on the business. Mohiuddin also suggested the government for timely implementation of projects as the cost of those projects escalate exorbitantly for the delays in implementation of the projects. He demanded steps to keep the bank interest rate at single digit and to create an investment-friendly business environment for attracting more domestic and foreign direct investment. The FBCCI also demanded uninterrupted power supply and development of economic zones as soon as possible. He said the cost of doing business will go down if the budget is implemented.